Cookbook Review: Another Fork in the Trail | Awesome. Vegan. Rad. 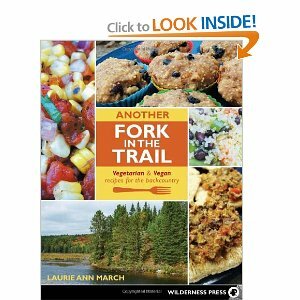 The nice folks at Wilderness Press recently sent me Another Fork in the Trail, Vegetarian and Vegan Recipes for the Backcountry, by Laurie Ann March. I really had no idea what I was getting myself into with this book, as I hadn’t read her first book (Fork in the Trail), but it’s such a neat concept! All the recipes are designed to make sure you’re eating healthy and heartily on backpacking and camping trips into the wild. The only problem I had with that is that most of the recipes call for dehydrating, then you rehydrate them and sometimes finish assembling them (depending on the recipe) out in the wild. Which would be fine, if my dehydrator had lined fruit leather trays, but I inherited my mom’s old (circa 1992?) dehydrator and it is pretty low-tech. Whatever, though! I threw caution to the wind and just made some recipes, skipping the whole dehydration aspect. I suppose then that you could say that I cannot vouch for how well these dishes rehydrate, but I’ve eaten a lot of rehydrated dehydrated soup in my day, and I think it’s safe to say that you don’t need to worry about it. Plus, the instructions are crazy detailed, so I think it would be pretty difficult to screw it up. So, without further ado, the recipes I tried! A lot of the recipes from Another Fork in the Trail are really basic and uncomplicated (although there are a few with some terribly obscure ingredients), which might seem kind of boring to the untrained eye, but you can really judge a cookbook by how delicious its most basic recipes are. Therefore, I made this Couscous Pilaf. 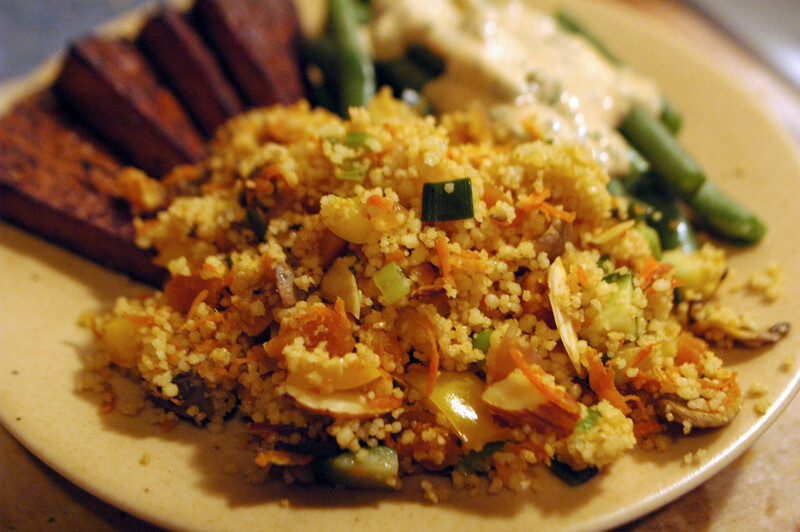 Because I love couscous and I love pilafs and I’m always up for another recipe to try. Couscous is really great for cooking outdoors, if you think about it, because all you have to do is boil water, and then you’re done. 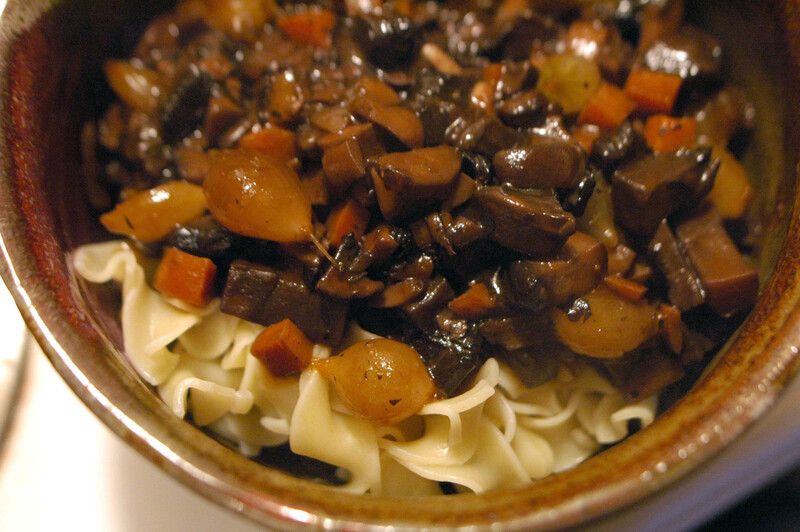 This recipe calls for some yummy veggies (mushrooms, peppers, zucchini, carrot) and some nice add-ins (green onions, almonds, apricots), but where it really blew me away was the addition of caraway seeds. Genius! And delicious! It was darned easy to throw together, and I’m sure it would come along easily in the woods, too. I rounded it out with some baked tofu and steamed green beans with a tahini sauce. I’m pretty sure I screwed this one up, because I don’t know how to do basic things like cook red lentils. I’ll explain momentarily. Above you see Lentils with Apples and Wild Rice (yum! right?! ), which I figured would just be the embodiment of fall. And the flavor is totally spot on – a little smoky, lemony, sweet, savory. 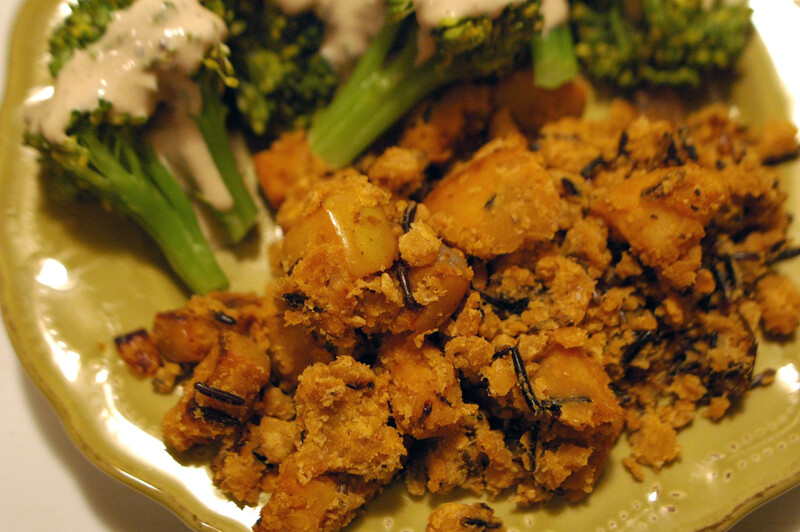 The only thing wrong with this dish was the fact that it was crumbly and dry, lentil-wise. But I really do think that it’s my fault. The recipe says to cook the red lentils according to your package instructions, but I buy my red lentils in bulk and so obviously there are no instructions. And then it occurred to me that I really only ever cook red lentils with things, like in dhal. So I slunk away to the internet, which told me basically what I already knew, cook ’em for about 25 minutes with 1 1/2 cups of liquid per cup of lentils. Except I don’t think red lentils work that way. I mean, they were cooked, but they are designed to fall apart and become creamy, and without extra liquid, that just isn’t possible. Basically, what I’m saying is that the recipe should say how they want these lentils cooked, and for those of you who have or procure this book, cook them with extra liquid, for sure. Because as a creamy dish, this would rock. The apples are nice and soft, the wild rice is chewy…that creamy texture would have just ruled the school. Alas. Next time. Hey, you know those candied nuts they have at movie theaters that you can’t have because they have butter in them? Yeah, those are super easy to make, apparently. 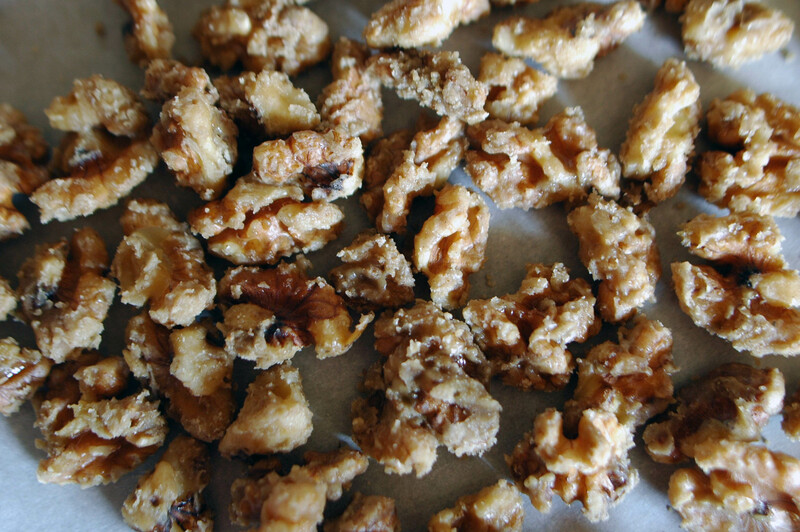 These are Maple Sugared Walnuts and they are impossible to keep in the house, because semi-vegan boyfriends love them. I seriously got to eat, like, 4 of these. And they’re so yummy! Sweet, buttery (the vegan kind), and just a teensy bit spicy (next time I will make them more so). And the surprising ingredient? Cardamom. I’m always a little afraid of cardamom because whew, it smells so strong when I open it up. However, it was a darned delicious addition to these nuts. There are a couple other sugared nuts recipes in this book that I can’t wait to try now! And what a perfect mid-morning snack for when you’re out on a hike, seriously. 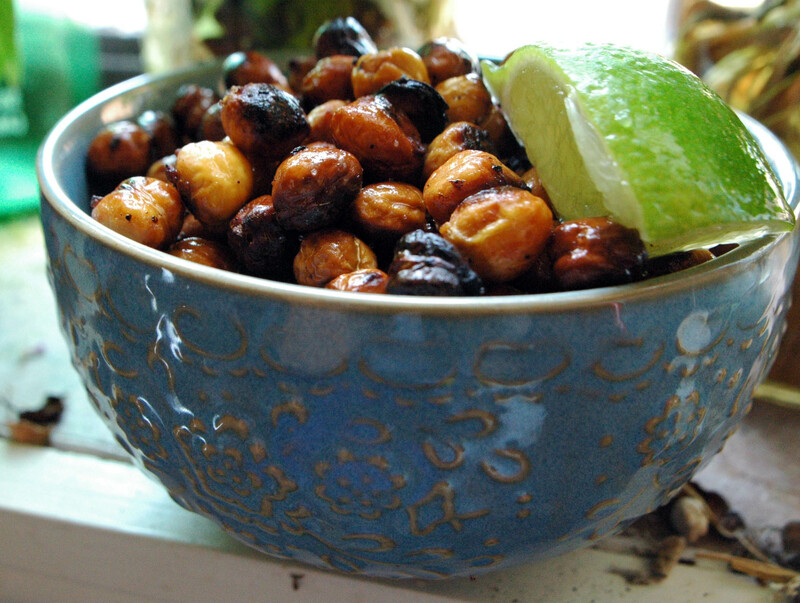 Lime and Black Pepper Roasted Chickpeas are delightful to eat when you’re drinking beer. I can tell you this from experience. Unfortunately, I burned mine a little bit, but I absolutely loved how crunchy and salty these were. And really, what a nice thing to munch on: full of protein and practically no fat (ok, a little fat, but really not much). Plus, we should all be making our own snack foods instead of either spending top dollar on the organic snacks (seriously, $4 for a tiny bag of chips, sheesh) or low dollar on highly processed crap that is bad for you, or medium dollar on things like hummus, which we should all be making at home because, duh, it’s so easy (yes, I buy hummus sometimes, too, ugh). Speaking of hummus-type things, the last things I made out the book were a couple of dips, because we like to snack at my house. 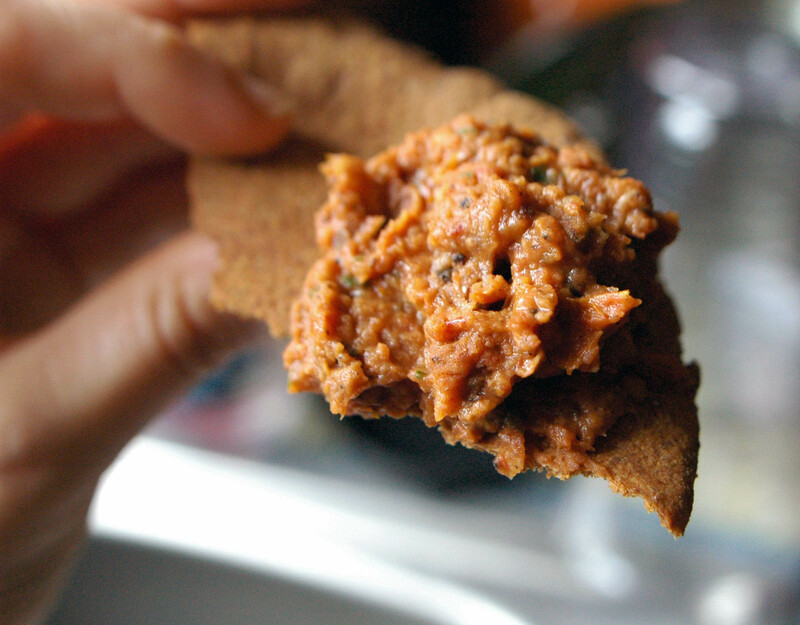 At least that’s what the semi-vegan boyfriend thought about this Roasted Tomato Dip. He ate pretty much the entire container of it, because I did not love it. Mostly because I added the optional lime zest because usually I love lime flavored things, but not this time. I don’t know why, but it just did not hit the spot for me. Still, I like the bones of this recipe. And I loved the smell of the tomatoes roasting with onions and garlic! Yum! But next time I’m going to take it Italian-style and just add some basil and call it a day. 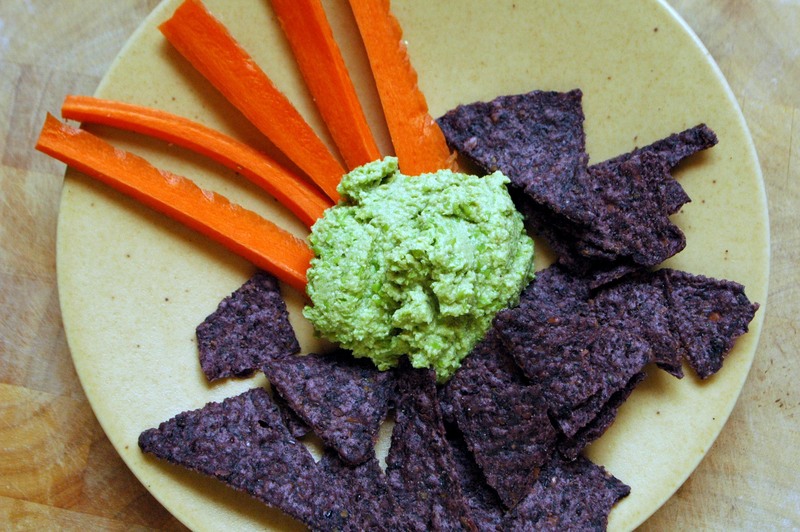 This (and the other dip recipes) calls for dehydration, but really if you’re just going out for a day or two, you could totally just keep this stuff in your cooler and snack on it whenever you feel like it. Like while you’re boiling the water for couscous or whatever. I have been eating the heck out of this Ginger, Wasabi, Edamame Spread. Not only is it tasty as a thick and hearty dip, it’s great spread onto tortillas and topped with carrots and tomatoes, eaten like a quesadilla. And it’s good on a bagel with some tomato, salt and pepper. I’m pretty sure it would be great as a spread just about anywhere, like a sandwich or a wrap, or you could just eat it with a spoon. Delightfully green, it has a distinct, but not overpowering ginger flavor, with some zing from the wasabi powder. It’s almost refreshing to eat it. The only thing I wish I could have tried but couldn’t from Another Fork in the Trail were the baking recipes. They are all designed to be baked in a camp oven, with no instructions included in the recipe in case you just want to make the stuff at home. (It says how long to bake everything, but never at what temperature…if anyone happens to just know this information, please send it my way! I really want to make things like Lemon Rosemary Cupcakes!) All in all though, I had fun cooking from this book! There are some seriously tasty treats in here, and if you’re an outdoorsy vegan or vegetarian, I don’t know how you could not buy it. But even for us couch-campers, there are some great recipes to try. Lots of snacks! And semi-vegan boyfriend friendly meals! Get to it! The roasted chickpeas sound really good and I love the idea of edamame dip! Yum! That’s a cool concept for a book. The chickpeas and dips look freakin’ good! Hi there. Every morning I have a cup of tea and take a peek to see who’s being blogging about the books. It’s a great way to see how recipes are being used and it’s fun to see how people photograph them. Sorry about the lentil thing—I should have been more specific… and you are right, you want them creamy. When the edition gets a revision I’ll be sure to add that in as it was a definite oversight. Thanks for mentioning it as the feedback is appreciated. If you’d like home-baking temperatures please send me an email through my website and I can send you temperatures and times. Thanks so much for the review and testing so many of the recipes. It sounds like you really enjoyed it. This sounds like a great cookbook, even if you’re not venturing outdoors. The spiced nuts look really fantastic! Often, on our way to a favorite trailhead, we would stop at a little gourmet shop in the outskirts of a close-by town to purchase a package of sugared walnuts. Unfortunately there isn’t a little gourmet shop on the way to every trailhead or access point, so I was inspired to create my own version of maple sugared walnuts. Line a cookie sheet with parchment paper and set aside. Melt the butter or butter substitute over medium heat in a heavy-bottomed skillet. Add the maple syrup and heat, stirring constantly with a wooden spoon, until the mixture starts to bubble, foam, and becomes slightly opaque. You’ll feel the syrup tightening up. Reduce the heat to low. Then add the salt, cardamom, and wasabi powder to taste, stirring to combine well. Add the nuts and continue stirring for about 2 minutes to coat evenly. As soon as the mixture coating the nuts seems dry and sugary, remove the pan from the heat and spread the nuts in a single layer on the parchment paper–lined cookie sheet. Use two forks to separate the nuts. Allow to cool for at least an hour before packaging and store in an airtight container until you leave for your trip. Then, transfer the nuts to a ziplock freezer bag and remove as much of the air as possible. It is important to use a heavy-bottomed skillet or frying pan for this recipe so that you do not scorch the syrup mixture. You must stir the mixture constantly or it will burn. Use only Grade A light or medium pure maple syrup for this recipe, as anything else will give poor results. awesome! thanks for sharing, Laurie!